An overhaul of the online local food guide of farms, produce, farmers' markets, and more, built with WordPress. A project of Seacoast Eat Local. The original Seacoast Harvest site was developed as a PHP/HTML site with a custom MySQL database. The site was difficult to update and required some custom data types. This HTML site was converted to the WordPress Content Management System (CMS) is now an easier to update 2.0 version. Custom post types were used for farms, farmers’ markets, a harvest calendar, sponsors, and an agricultural glossary. The plugin Advanced Custom Fields was used create easy to update pages in the WordPress admin. This large project also used Google Docs to gather data, updated by a team of volunteers. A CSV data import utility was required to get the data into the WordPress site. The custom content plugin Pods was used to import this data into posts and post meta data. Standard WordPress search in post meta data proved to be too slow, so custom search code was written in PHP to serve up fast search results to allow visitors to quickly find produce and farms. The site also need to be mobile responsive so the custom theme used the Twitter Bootstrap CSS framework. The WordPress SEO by Yoast plugin was used to create SEO friendly pages and a complete sitemap of custom post type data. To increase page load speed, the plugin W3 Total Cache is used to create cached version of pages, and some frequently searched terms. Additional page load speed optimization was done using image optimization, gzip compression, and browser file caching. 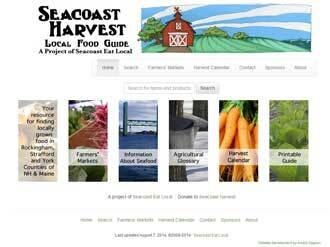 The new 2.0 version of Seacoast Harvest is much easier to update and serves visitors with fast search results for local food. "I just won 3 days of my life back, thanks to the amazing work of Andy Gagnon and his web skills - he's creating the updated (and mobile friendly) version of Seacoast Eat Local and I can't thank him enough. He does amazing web work."